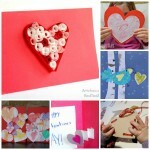 Today’s Collage Heart Cards for Toddlers are super simple to set up and make. The kids will adore getting stuck in (literally) and it is a great way to use up odds and ends in your craft box! Though these collage hearts are the perfect Valentine Craft Ideas for Preschoolers, I think they make lovely generic Heart Craft (we have an amazing 101 Heart crafts!!) 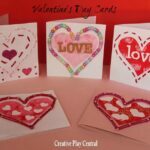 which you can make and send to loved ones all year round (especially on Mother’s Day or Granny’s birthday). 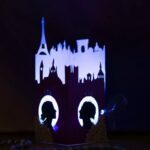 This is a guest post from the lovely Carol from My Bored Toddler and forms part of the 31 Days of Love series. 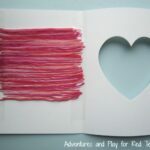 More ideas from years gone by here Valentine Day Treats, Valentine Decorations and Valentine Cards for Kids. 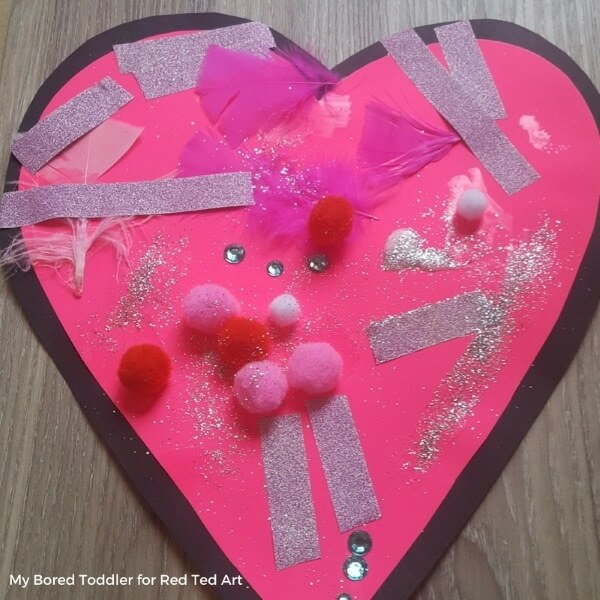 Hi, I’m Carol from My Bored Toddler, and it’s lovely to be part of Red Ted Art’s 31 Days of Love series again. Last year I made a Valentine’s Day Rainbow Fish and this year we are making large collage hearts. 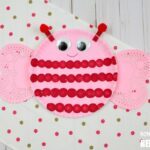 As I mainly blog about toddler crafts and activities, this is a craft that involves very little parent involvement, and is designed for younger children from the ages of 18 months old. What I love about this activity is that all ages can participate in this activity and it is great if you have different aged children wishing to do the same activity. This is also a great inexpensive craft. I love collages as they are a great way to clear out your craft boxes. We’ve kept with the pink, purple and red theme for today, but feel free to mix it up. While I purchased a lot of the activities for today’s activity, check what you have at home first. Use up old ribbon, pompoms, pictures from magazines, old wrapping paper and whatever you can find. That’s the beauty of a collage! 3 sheets of colored cardboard. 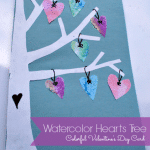 I used pink and purple for the hearts and framed them with black card. Good quality PVA glue (try to avoid glue sticks as pom poms and larger items will fall off). 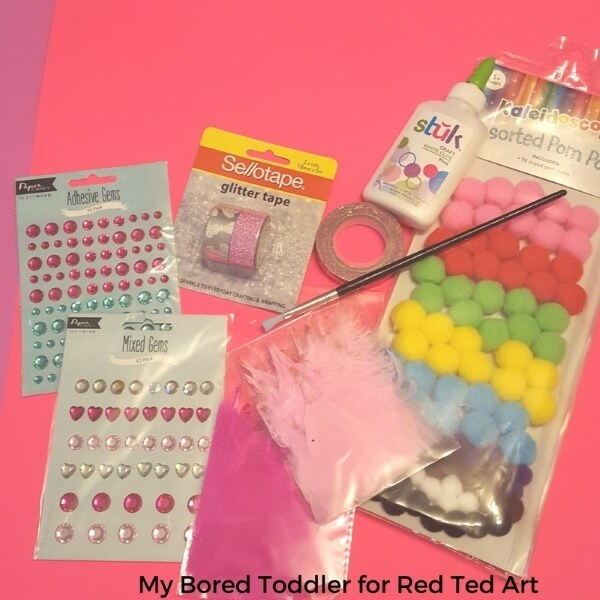 Adhesive gemstones (the adhesive ones are much easier than the glue on ones – especially for toddlers and pre-schoolers). 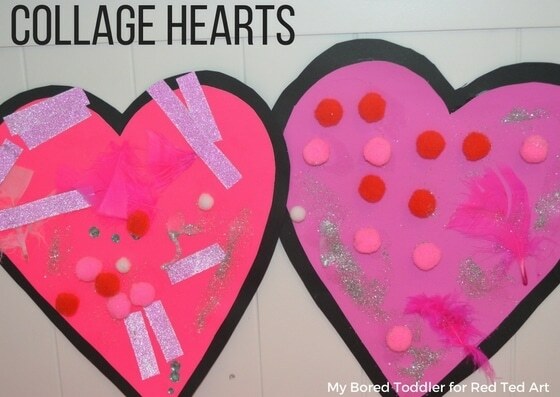 Because this activity was aimed at toddlers I cut out large hearts on the pink and purple paper and cut them out. Older children would be able to cut them out themselves. I like to set up the collage materials in a tray, a lot like an invitation to play. I didn’t use an example or have one for them to copy, as creativity is the key to collages. I wanted them to make it the way they wanted to, rather than copying a design of mine. Once you are set up, let them get creative! I love how each design is different and I would love to see what yours look like when you make them. I framed these using black cardboard. 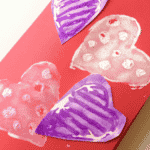 To do this, glue the finished hearts onto the black cardboard and cut them out leaving a 1cm border. Older children should be able to do this part themselves. 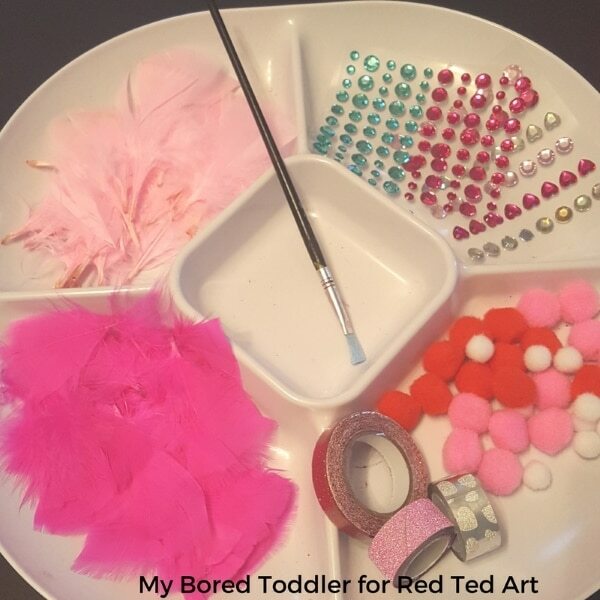 I hope you and your child have fun with this activity, and if you are looking for more toddler friendly activities please visit My Bored Toddler or follow us on Instagram, Facebook or Pinterest. 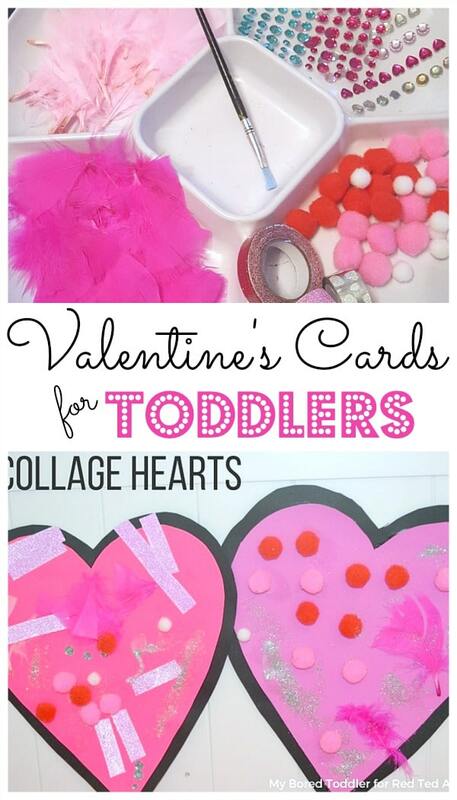 Aren’t these collage heart cards for toddlers simply adorable? I know the kids will LOVE having a go at them and it is agreat way to use up odds and ends in your craft box. Always good to use up the old and freshen up your craft box. 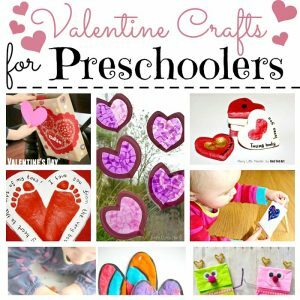 If you fancy more fabulous Valentine Crafts for Preschooler ideas, do take a peak at this selection from over the years. So many fantastic ideas! 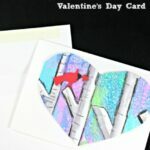 We also have many more cute and easy Valentine Cards for Kids to make and send. Many make wonderful keepsake to send to grandparents and family members, as well as for gifting to friends at preschool!